Some might say that most businesses benefit their communities just by their very existence through job creation and paying taxes. Although that may be true, in today’s community-driven culture, consumers demand more. Besides running a safe and honest operation, consumers want to see their local businesses be more involved in proactively helping their local communities, even in areas that are completely unrelated to the business that they conduct. Corporate charitable giving is a priority for many consumers, but in times of austerity, the bottom line might not allow businesses to live up to the generosity consumers expect. We firmly believe that all businesses, including for-profit ones have a duty to support the communities that support them in any way they can. We believe textile recycling is the green-tech solution to the dilemma of charity versus profit. The average Canadian disposes 7kg of textile waste per year…that’s a lot of clothes! With a residential waste diversion rate of approx 36%, we know that most of it is ending up in landfills, which will be at capacity in 25 years. Textile waste diversion is the solution to this serious issue. Clothes are donated by the public and then reused/resold/recycled depending on their condition. The clients that Textile Waste Diversion works with are all registered charities, so the proceeds generated from the recycling process helps to sustain services essential to struggling Ontarians. The clothing collection is done through our fully insured used clothing donation bins that are generously hosted by a myriad of unrelated companies and property managers across Ontario. Our donation bins and the servicing of these bins are provided at no cost to the business or property owner. A bin can be placed in any space outdoors of any business or residential property. Most often, they are placed near parking lots, so they do not interfere with peoples’ ability to access the building. The bins are then filled with donated textiles, by responsible employees, customers, and neighbours that understand the value their donations provide their local community. So the boxes help charities sustain services. Great. But what’s in it for you as a business owner or manager? We provide the service is free. That makes it easy. But did you know that our bins can also save you money in tipping fees? Businesses that have substantial garbage bins on their property are often plagued with people who dump of small furniture or houseware items, increasing annual tipping fees. Any debris that is left by our bins is removed by us quickly and at no charge. 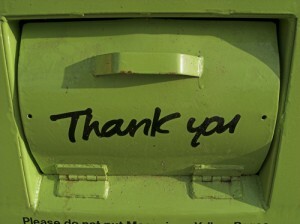 It’s our way of saying thank you for generously hosting our bin. We collect the bins daily and keep the area around the bins meticulously clean. Because the bin belongs to a registered charity, it gives the clear message that your business is taking the extra step to support community efforts. And when your employees or customers research the charity, they will see what wonderful things are being done with the help of your business’s participation in the program. It also lets your employees and customers know that when you fund charities, you do so in a manner that is sustainable, increases your neighbourhood’s waste diversion rate, and provides local employment. Clothing donation bins provide a convenient public service for your neighbourhood. And, in neighbourhoods that have limits on weekly garbage collection, by hosting a bin on your property, you are offering a convenient, free and environmentally responsible alternative to poisoning a landfill. How Much Textile Waste Can There Be? Our bins are really busy, enough to warrant daily collection. THAT’s how much textiles are disposed of, and how eager residents are to help out once they know the benefit of a bin. It is estimated that for every 1000 tonnes of textile waste collected, 7 full time and 15 indirect jobs are created. In 2013 alone we are projecting the collection of 30 million pounds of textiles and 2 million pounds of misc recyclables ourselves. On that note, although we don’t traditionally collect it, if your business has e-waste, just toss it in the bin. We can process that too. Once area residents learn about a donation bin, it brings extra foot traffic by your establishment, too! Clothing donation bins are a win win for your business and your community, so consider hosting a bin today!